Wiping the logical drive's deleted data does not delete existing files and folders. It processes all unoccupied drive space so that recovery of previously deleted files becomes impossible. Installed applications and existing data are not touched or affected by this process. Active@ KillDisk wipes unused data residue from file slack space, unused sectors, and unused space in MTF records or system records. 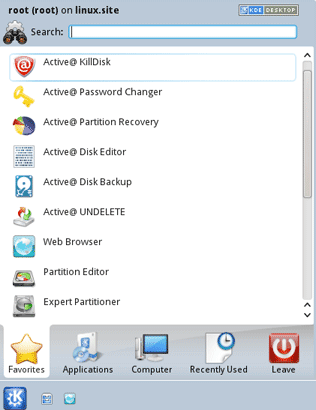 When you erase data with Active@ KillDisk, you destroy data permanently, conforming to any one of six international standards or your own custom settings. Wiping drive space or erasing data can take a long time, so perform these operations when you are prepared to wait. For example, these operations may be run overnight. 1. From the Active@ LiveCD shell, click Start > Favorites > Active@ KillDisk. After initializing, the Active@ KillDisk workspace appears with all available devices listed under Local System Devices. 2. Click a physical drive or a logical drive to select it. Properties of the selected device will appear in the Properties tab. 3. To scan the selected logical drive, click Scan. The Progress tab will appear, showing the status of the scan while Time Left counts down the remaining time. 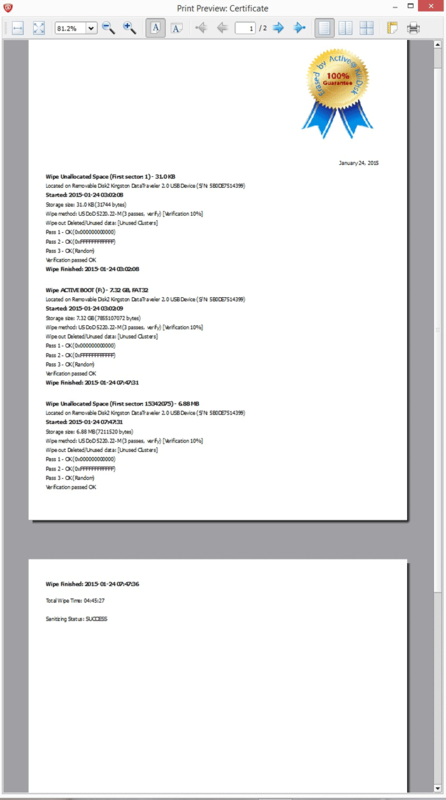 When the scan completes, sub-folders will appear in the System Local Devices list and the folders and files in the selected drive will appear in the Folders and Files tab. Available files and folders will appear with a colored icon. Deleted files and folders will appear with a gray icon. Select existing and deleted folder and file information in the Folders and Files tab. View sectors of data in a device or a logical drive. In order to do that select a device or a drive and click Hex Preview. The Data Viewer appears. Scroll through the available data. Select a logical drive. Files and folders appear in the right panel. In the right panel, select a file. Click Hex Preview. The Data Viewer appears. Scroll through the available data. Select the check box next to a device or logical drive or multiple devices or logical drives. Click Wipe which will open up. 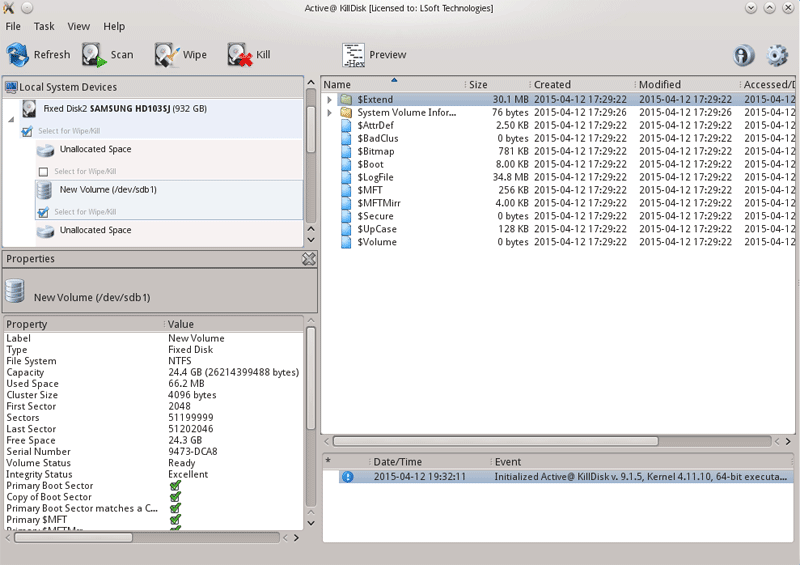 The Wipe Free Disk Space dialog box appears. Choose one of the methods from the Wipe Method list. To set other wiping parameters click on more options… in the bottom left corner. The Confirm Action dialog box appears. The process will be initialized with the Progress bar appearing at the lower side of the right panel. 7. To stop the process at any time, press ESC or click at the Stop All button near the progress bar. You can also stop the drive wipe by pressing the little red square near the progress bar at the Local System Devices. Select the check box next to a device or logical drive or multiple devices or multiple logical drives. Click Kill. The Kill dialog box opens up. Set erasing parameters by clicking on more options… in the bottom left corner. Once you have adjusted the settings to your liking press Apply. If the Skip Confirmation check box is clear, the Confirm Action dialog box will open up. This is the final step before removing data from the selected drive for ever. Type ERASE-ALL-DATA in the text box and press ENTER or click OK. The process will start and the Progress bar will appear. To stop the process at any time, press ESC. You can also end the process by clicking on Stop All button or by clicking on the red square near the progress bar at the Load System Devices. After the Wipe or Kill operation is complete, information about the wipe or erase session will be displayed in the Session Log. One Pass Zeros or One Pass Random: The number of passes is fixed and cannot be changed. When the write head passes through a sector, it writes only zeros or a series of random characters. US DoD 5220.22-M: The write head passes over the each sector three times. The first time with zeros (0x00), second time with 0xFF and the third time with random characters. There is one final pass to verify random characters by reading. US Army AR380-19: The write head passes over the each sector three times. The first time with 0xFF, the second time with zeros (0x00), and the third time with random characters. There is one final pass to verify random characters by reading. Canadian OPS-II: The write head passes over the each sector seven times (0x00, 0xFF, 0x00, 0xFF, 0x00, 0xFF, Random). There is one final pass to verify random characters by reading. Canadian CSEC ITSG-06: The write head passes over the each sector three times (0xFF, 0x00, Random). There is one final pass to verify random characters by reading. German VSITR: The write head passes over each sector seven times. (0x00, 0xFF, 0x00, 0xFF, 0x00, 0xFF, 0xAA). There is one final pass to verify random characters by reading. Russian GOST p50739-95: The write head passes over each sector two times (p0x00, Random). There is one final pass to verify random characters by reading.five times. Gutmann most secure method: The write head passes over each sector 35 times overwriting data with different patterns.For more details about the most secure data erasing standard, you can read the original article at the link. User Defined: You indicate the number of times the write head passes over each sector. Each overwriting pass is performed with a buffer you supply separately, using ASCII or HEX values. Please read KillDisk manual for more details about featured erasing methods. Verification: In order to verify the wipe method, you will need to select the Verification check box and set the amount of area the utility will read. Because verification is a long process, you can specify a percentage of the surface to be verified. To wipe or erase without verification, clear this check box. You can choose to run only one or two of these options in order to make the process faster. If you want a thorough wiping of unused space, then include all of the three options. Retry Attempts: To specify the number of retries to do when an error is encountered, enter the number in Retry Attempts. Ignore Errors: To hide error messages while data wiping, erasing or verification is in progress, select the Ignore Errors check box. To show all error messages during wiping, erasing or verification, clear the Ignore Errors check box. All errors are written to the session log in either case. Clear Log File before Start: To truncate the session log before erasing or wiping starts, select the Clear Log File before Start check box. To append this session's information to the existing session log, clear the Clear Log File before Start check box. Skip Confirmation: The confirmation dialog box is the final step before either erasing or wiping data. To bypass this dialog box, select the Skip Confirmation check box. To include this safety step, clear the Skip Confirmation check box. It is safer to run Active@ KillDisk with this check box cleared (default state). General parameters allow you to turn features on or off or change default setting before you erase or wipe data from an unoccupied space. You can also change the look and feel of the application and its logging options. To view and change settings, press the F2 key, or click the Settings toolbar button. Initialize Disk(s) after Erase: Because of the BIOS restrictions of some manufacturers, a hard disk device that is larger than 300 MB must have a MBR (Master Boot Record) in sector zero. If you erase sector zero and fill it with zeros or random characters, you might find that you cannot use the hard drive after erasing the data. 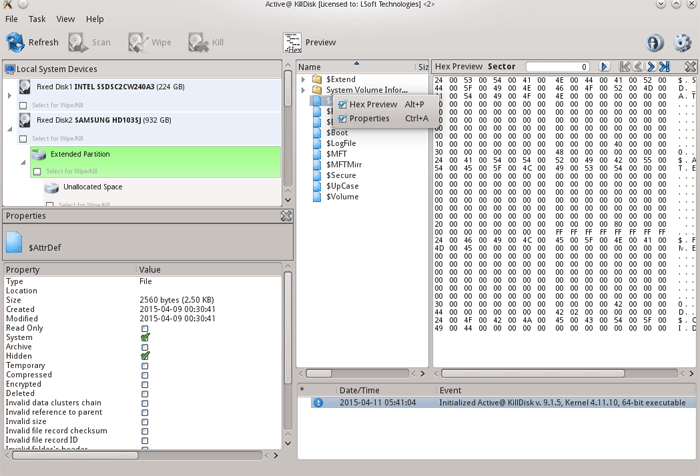 For this reason KillDisk is programmed to create an empty partition table and write a typical MBR in sector zero. This process is otherwise known as disk initialization. If by a chance the errors have occurred or the erasing has been stopped, status will be FAILED and displayed in red color. 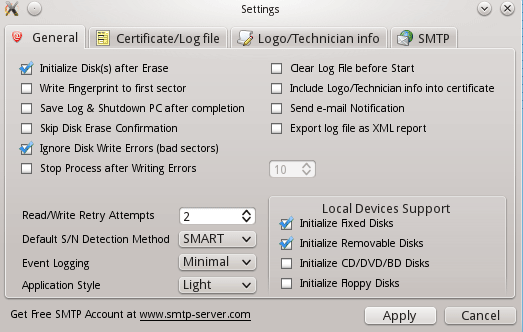 Save Log & Shutdown PC after completion: Erasing can take many hours. You can leave the KillDisk working and set it to turn the computer off when erasing is completed. A log file will be saved and can be reviewed later. Skip Disk Erase Confirmation: The confirmation screen is the final step before erasing data. In this screen, you type ERASE-ALL-DATA to confirm what is about to happen. If Skip Confirmation is turned on, this final safety request will not be shown. This option is typically used with caution by advanced users in order to speed up the process. It is safer to run KillDisk when the Skip Disk Confirmation check box is left empty (default state). You may want to use this as a safety measure to ensure that data from the correct drive location is going to be erased completely with no possibility of future data recovery. Ignore Disk Write Errors (bad sectors): If this option is turned on, error messages will not be displayed while data erasing or verification is in progress. All information about errors will be written in the KILLDISK.LOG file. These messages will be displayed in the final Erasing report after the process has been completed. Stop Process after Writing Errors: If by any chance writing errors appear during the wipe or deletion, you can adjust after how many errors would you like the KillDisk to terminate the process. Clear Log File before Start: To truncate the session log before erasing or wiping starts, select the Clear Log File before Start check box. To append this session’s information to the existing session log, clear the Clear Log File before Start check box. Note! For detailed instructions, see the Active@ KillDisk Documentation.